imPRESS shows the work created at PRESS over a span of two months by six of MASS MoCA’s Teenspace participants: Caitlyn Howland, Evan Sanders, Noelle Gageant, Evan Canales, Hugo Seven and Harry Seven. It opens on June 20th as part of the first DownStreet Art opening of the 2013 summer season with a reception from 6-9 p.m. 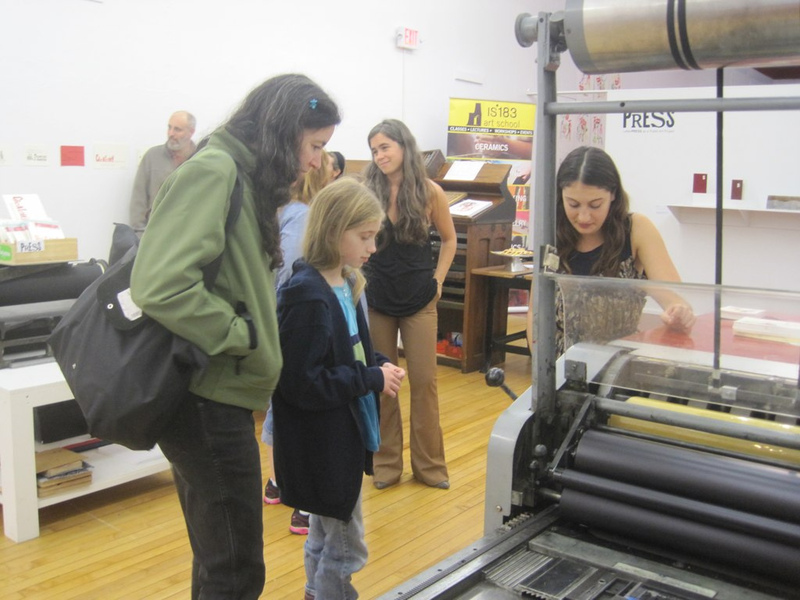 The students worked with MASS MoCA exhibiting artist Johnny Carrera and PRESS Founder and MCLA Associate Professor of Visual Art Melanie Mowinski, to learn about printmaking, typography, letterpress and experimental & traditional relief printing. Shannon Toye, Kidspace’s School Program Coordinator, helped coordinate classes and materials. Liminality features prints and artist books that mark the space between having departed but not yet arrived by Valerie Carrigan, an artist and educator living in North Adams, Massachusetts. Valerie has been awarded the 2013 Northern Berkshire Cultural Council Individual Artist Grant, which has supported the new body of work seen in this exhibition. 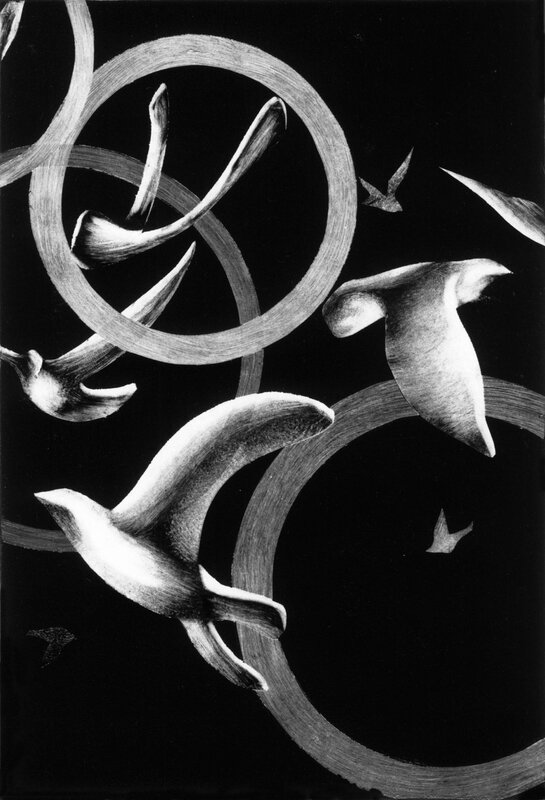 Examples of her work can be found in numerous collections, including the Denver Penrose Library, Smith College Book Arts Collection and the University of Vermont Book Arts Collection. 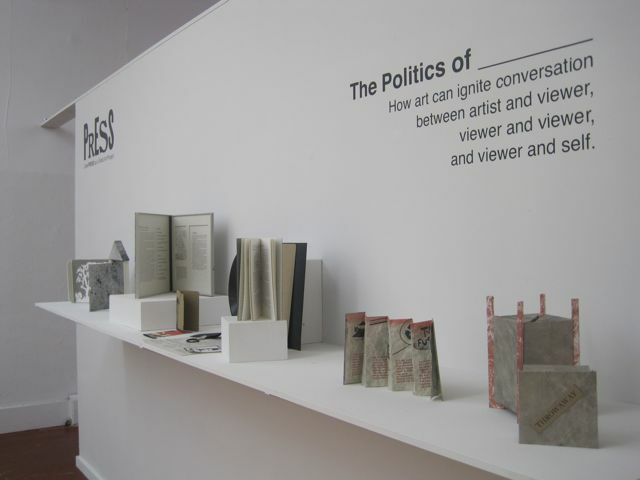 The Politics of ____ examines how art can ignite conversation between artist and viewer, viewer and viewer and viewer and self. The works exhibited move beyond what is assumed when thinking about political art. The show is PRESS’ first ever Call for Entries exhibition. Ten submissions were selected from a very competitive pool of entries resulting in a show that features eleven different artists from as far as Washington State and as near as Church Street, North Adams. See the gallery binder for additional artist information. Inspired by the 1980’s Re-Flex song “The Politics of Dancing” The Politics of _________ asks how does the political enter artwork? Here political in art is defined as work created with the intention to spark conversation. It can be about dancing, government, love, privacy, whatever. But it must somehow explore the real and imagined ways of creating conversation. Markings features letterpress prints and artist books by former PRESS interns and volunteers Adriana Alexatos, Hayley Parker, Antoine Scalbert, and Leeya Jackson as well as PRESS founder Melanie Mowinski. 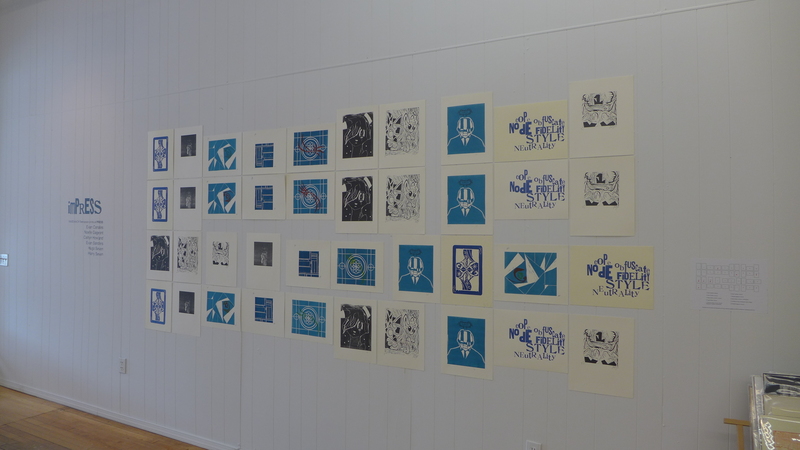 Inspiration for this exhibit stems from a quote by Theodore Roethke: “Time marks us while we are marking time.” Each artwork created reflects time spent in the studio, at the press, or at the typecase, considering text and image. Each mark on the page is a mark in time, whether a day in the life of an intern, or months of work towards an end goal.